The plan was to improve the internal electrics considerably. 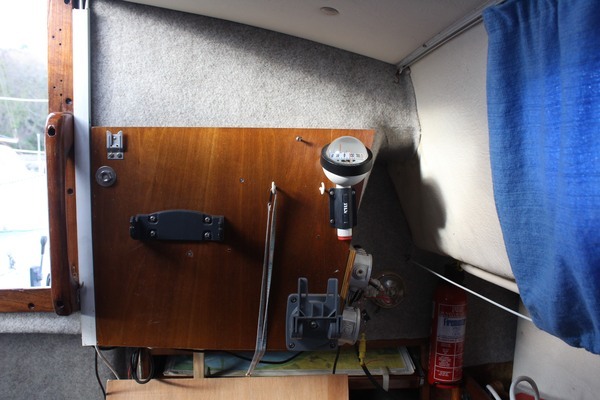 The first job was to create a proper housing that would take the electrics switch panels from the engine housing to a dedicated box mounted above the retractable chart table. I spend quite some time to trace and document most internal wiring and remove a ton of obsolete cabling. However, while on the boat, I thought I go for a little sail. Turning the engine start key..nothing happened. Normally there is a click and the starting engine kicks in. To cut a long story short, I spend the next couple of hours tracing all the engine wiring. I could not find an connection from the engine control panel to the battery negative. After turning the generator a few turns by hand, the starting relay kicked in and the engine started. I motored to the quays where the family joined and we dried out. When the boat started leaning out towards the river, considerable tension came on the mooring rope which I tend to tie from the quays ladder around my side stays. My swiss army knife came to the rescue not the 1st time this year and with a noisy twanngggg..., the old line snapped. Best to remember this for next time. 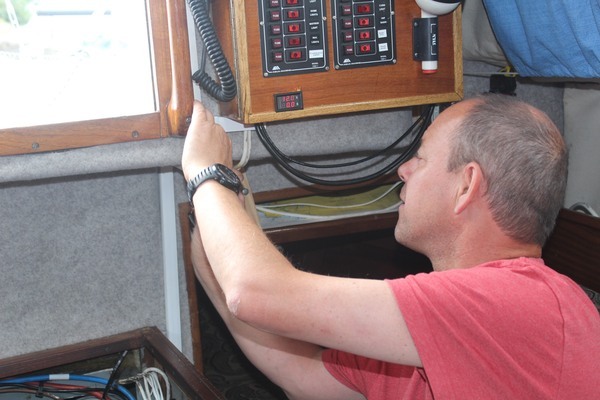 After an excellent breakfast I spend more time on the electrics and we motored back to our spot on the pontoon at 13:30. More weekends were following after this one to get it all back in working order.